Whether you’ve ever played the physical game of Paintball before or not, you’ve probably heard of one of its biggest stars: Greg Hastings. Much like Tony Hawk for skateboarding and Shaun White for Snowboarding, Greg Hastings is the poster boy for the sport of Paintball. 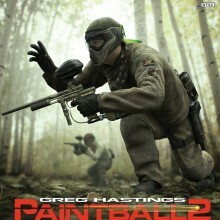 Over the course of the last few years, Greg Hastings has released several games in an attempt to garner more attention for the rising popularity of Paintball. After playing Greg Hastings Paintball for the original Xbox, I found myself wanting to break my controller at the sheer exhaustion of trying to play that game. Thankfully, most of the annoyances that plagued the original have been rectified for Greg Hastings Paintball 2. When you boot up the game, you’re asked to create a team. You choose your team by picking through trading cards that list each players particular skills; running speed, their quickness and accuracy in reloading, accuracy in your shooting and the use of paint grenades (amongst many more attributes). When you win events you can use the money you earn to either improve the skills of your specific player or for a larger sum of money you can improve the stat for your entire team. While there isn’t a tremendous amount of customization in GHP2, you are able to unlock new guns, barrels, clothes, masks; CO2 tanks and improve the amount of ammo you’re able to carry. By winning your first few matches you’re quickly able to upgrade to a newer gun with substantially longer range and accuracy (which makes the game substantially more enjoyable). As for the matches themselves, there’s not a tremendous amount to choose from. Most matches are 5v5 or 7v7 and the main goal is usually to Capture the Flag (CTF) or just to eliminate everyone on the other team, so be weary of repetition. Most of the combat is relatively straightforward; RT to fire is all you really need to know. While simplicity is definitely evident in the game, there are some cool aspects added in. For example, when your main character is eliminated, you’re automatically switched into the nearest player to continue the match, rather than being forced to sit there twiddling your thumbs until the match is over, given you a much higher likelihood of winning. When sprinting, your mask starts to fog up more and more, adding a breath of realism to an otherwise average game. Also, between matches the load screen shows photographs of “hall of fame” players over the years and little known facts about the sport. Graphically, the game isn’t anything incredible to look at, but it’s substantially better than some of the other games that have come out recently. However, the sound quality is very authentic from the sound of players being “marked”, to the sound of the balls being reloaded, the game does a great job of replicating the sounds of the sport. While Greg Hastings Paintball franchise will probably never be much better than it is now, this installment is leagues better than the previous ones in the series and is definitely more fun than I was anticipating and should be great for those who are fans of the sport.